A crypto currency or virtual currency is a digitally encrypted decentralized currency designed as a medium of exchange that uses cryptography as a form of security. Crypto currencies are decentralized and not connected to any form of government or central banking system. Decentralization of the crypto currency works through a public transaction database called a blockchain. This database functions as a distributed ledger and is produced and managed as a peer-to- peer network by the entire crypto currency system complying to a code for verifying new data blocks. 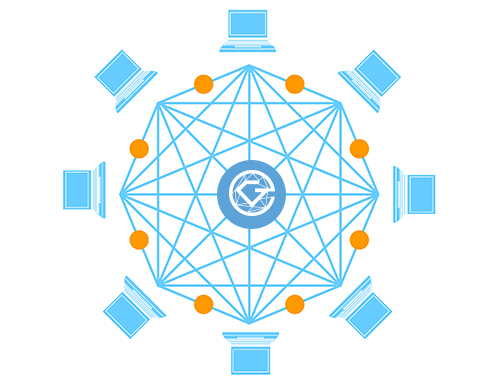 The system of a continuously growing list of records is known as a blockchain. It creates a record whose authenticity can be verified by the entire community. These blocks are a continuous list of increasing records, which are secured by cryptography. This peer-to- peer technology protects the integrity of digital information by offering all network members a synchronized and secure transaction record. One important feature of the data blocks on a blockchain are that, they cannot be edited once recorded. This in effect creates a tamper proof system, data becomes more reliable and parties can transact with confidence. GLITZKOIN plans to construct a diamond-trading blockchain platform, which will allow sellers to access markets previously not available to them. Additionally, consumers will eventually have the ability to buy directly from sellers. The goal is to give both professionals and novices, the capacity to purchase listed diamonds directly from the seller. This removes the multiple layers of brokers and commission agents that currently dominate the trade. The use of GLITZKOIN crypto currency coins to pay for the diamonds purchased, gets rid of expensive bank charges and currency conversion losses.